During heavy rainfall and storm events, tremendous amounts of polluted stormwater is generated. The increase of new developments in urban, commercial and industrial sectors increase the flood risk and if left unchecked will overburden existing stormwater infrastructure. Many councils require the installation of Onsite Detention Tanks for new developments. Onsite Detention Tanks attenuate the flow of the new developments thus relieving the pressure on the existing stormwater infrastructure. 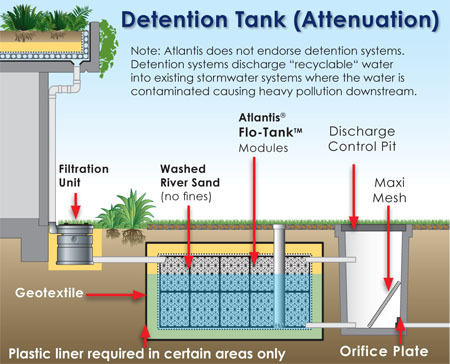 Atlantis Detention tanks provide a cost effective and durable solution for your onsite detention requirements. The Atlantis system provides rapid construction saving valuable time & labor on your project. Atlantis Flo-Tank® Detention Tanks can be easily installed by unskilled labor on any project saving valuable time, labor and money. Atlantis Flo-Tank® are available in many configuration to suit your projects design life and loading requirements. Our team of engineers will assist you in providing a suitable configuration to suit your project requirements. Atlantis Flo-Tank® Detention Tanks are a modular system providing scalable tank volume. The Atlantis modular tanks are suitable for commercial & residential projects. Stormwater is captured on site and channeled into an Atlantis Filtration Unit or Gross Pollutant Trap (G.P.T) where gross pollutants and sediments are filtered. The stormwater then fills the detention tank and is slowly released via the orifice plate located in the pre-cast discharge control pit (D.C.P). Filtration Unit or Gross Pollutant Trap to filter water.